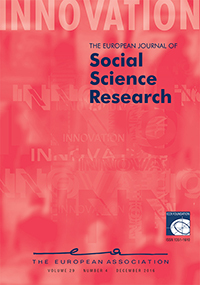 We are celebrating the 30th anniversary of the journal “Innovation – The European Journal of Social Science Research” published by Routledge. On this occasion we put together a special issue that is already now available online. Also, with the support of the Ministry for Science and Research, the City of Vienna and the Austrian Chamber of Commerce (Fachverband Bauindustrie) we are organizing a workshop discussing the future of the social sciences against the background of the structural change of knowledge.